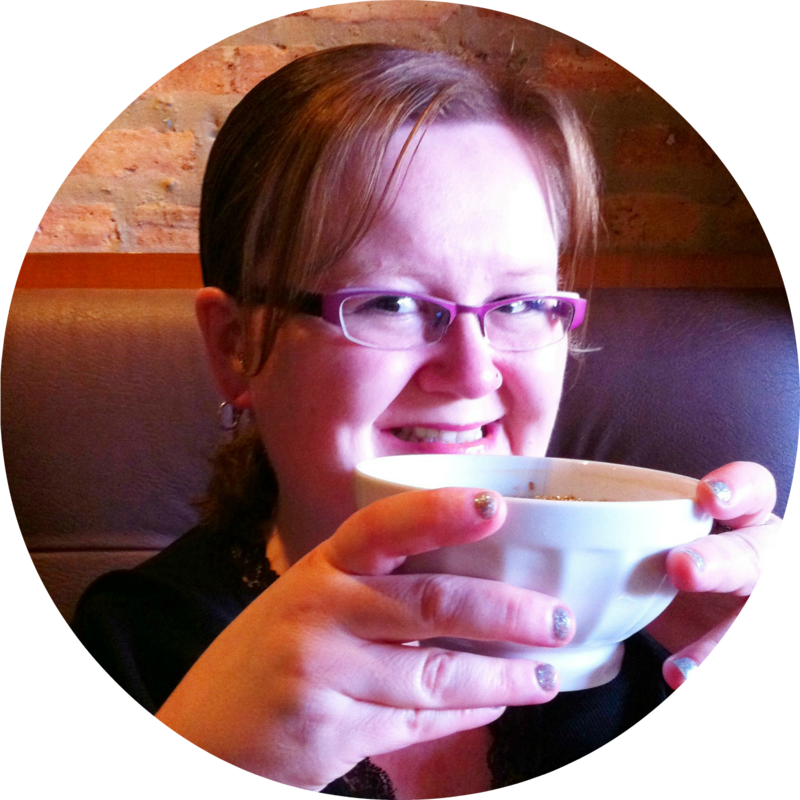 *Guest post by chicago foodie girl contributor, Sarah W.
I have much food stuff to write, but first: we've moved from downstate NY back to Western NY. where we had lived for years. Long story short, it's where we belong. Enjoying our return means checking out all the places we didn't check out before. Today my mom and I kicked that off by hitting many food stores. Of course, I have goodies! 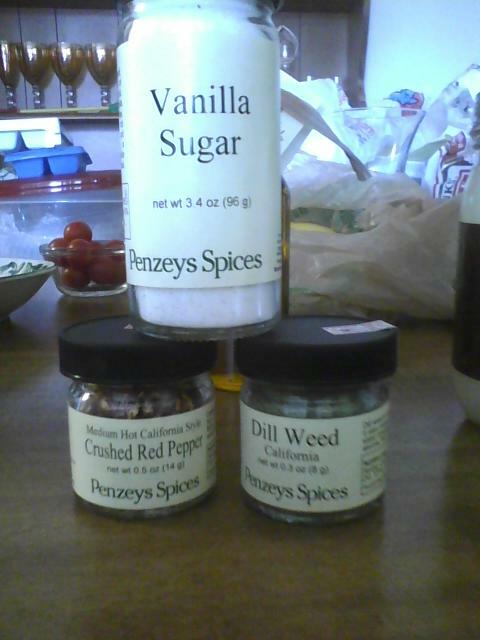 We started our trip with Penzey's Spices, as it came highly recommended to mom. They had a lot of spices, though I'd still go to an Indian grocery for curry. Too many spices smelled like taco seasoning, and I prefer differentiation. We both bought a few things, as most prices were reasonable, though I am not 100% sure if their spices were "more fresh" than the grocery store. I mean, it's all dried spices with no dates. I did like that they had many options and I hope what I did buy lives up to the hype. I think the hype of anywhere ends up making me more critical. At Penzey's I bought Vanilla Sugar, suggested uses: coffee and fruit; Dill Weed, because I am out of this; and Medium Hot Crushed Red Pepper. I love the idea of medium hot because I enjoy crushed red pepper but I don't always want my food super hot. From Penzey's we walked one block down Elmwood to Lexington Cooperative Market. I had no idea what to expect. I had found them while looking for health food stores because my mom has adopted a Paleo diet for 30 days and she wanted to find almond flour and/or coconut flour. Success! We found both! While the co-op would be a bit out of my way for regular shopping, it's clear that they serve the Elmwood/Allentown area and they do it well. It's certainly a place I'd suggest for gluten-free options. 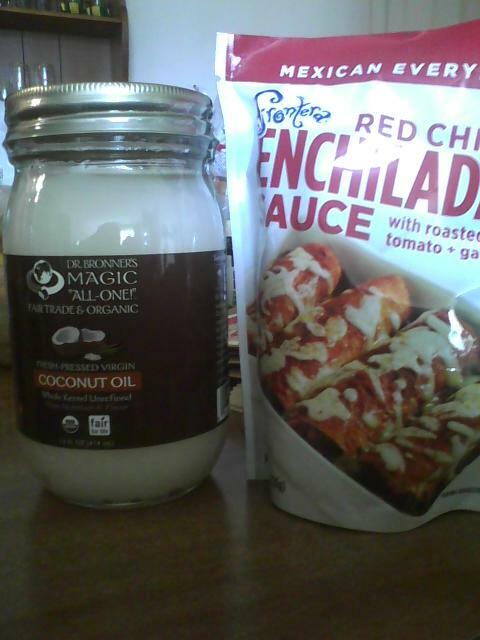 Curious and prompted by mom's experimenting, I got some coconut oil to use in place of olive oil in some places, as well as an enchilada sauce--which I've never seen anywhere. After a quick lunch at my apartment, we took the super short drive to East Aurora, NY. There are too many shops on Main St. to list. We stopped in Tuscany on Main to check out some olive oils. You could only test the oils in dipping bowls with bread, so we didn't try anything. We left the store and came back, and only when we came back and said no to the bread were we given cups. (Cups are a must, I don't want to dip where everyone else did and I really don't need the bread. Mom isn't eating bread.) We ended up both buying the California Harvest Citrus Habanero Olive Oil. I can't wait to saute some sugar snap peas in this. My favorite stop was Prima Oliva. This store reminded me of Pure Mountain Olive Oil in Rhinebeck, NY, and a welcome find, as I missed Pure Mountain. We were greeted immediately and were able to taste all vinegars and oils straight, in little cups. We tasted many things!! 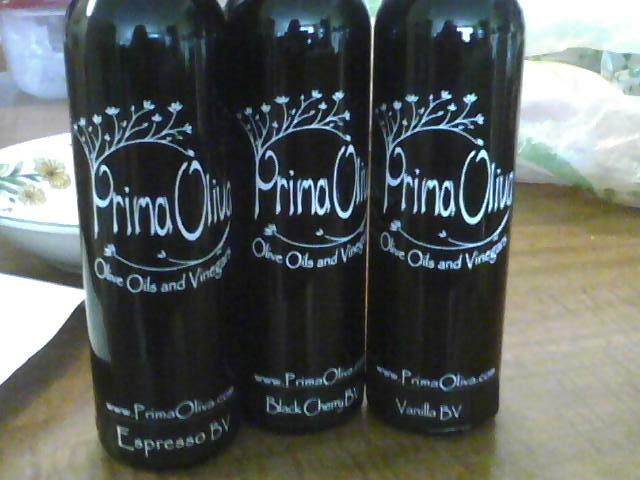 I bought 3 balsamic vinegars: Vanilla, Black Cherry, and Espresso. They also had dark chocolate and tons of other fruit flavors. I will certainly be back. 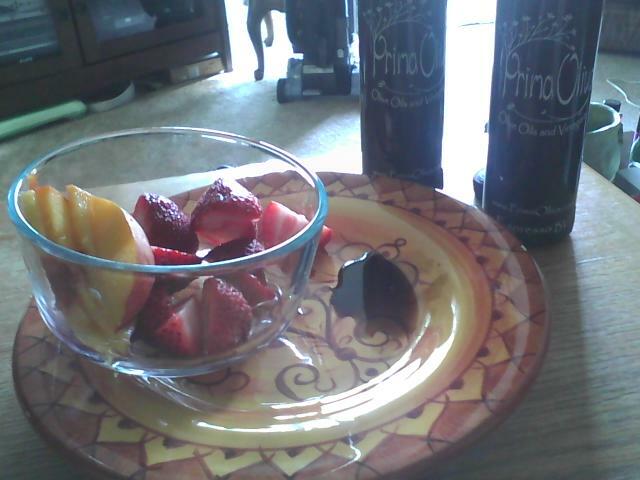 Tonight, after dinner, I cut up some strawberries and a bit of a nectarine. Strawberries tasted great with both, but I liked it best with the espresso, and the nectarine tasted great with the vanilla. The sales girl suggested some of these with ice cream, so I am thinking vanilla ice cream with the espresso (or I'll go back and get the chocolate) is certainly a try. Overall a fun day of new things! Congrats on the move--I love the western part of NY. Tuscany on Main sounds fantastic! I'll definitely have to check it out the next time I'm up there. I've been to D'Avolio a few times, which I really enjoyed. weary prof--I love WNY too! If you go to Tuscany on Main, keep walking, as Prima Oil is not that far down, on the same side of the street. Both places have different oils and vinegars, so I feel like it's worth going to both. Of course, as I find more shops, I'll post the suggetions! Just chiming in to say that I love Penzey's Spices! The Sicilian Salad Seasoning rocks! My boyfriend is actually from Western New York (Jamestown area), and I'll be there in two weeks visiting his family! I'm so excited. It's lovely up there, and so relaxing from my D.C. rat-race lifestyle. I'll have to look into Penzey's and the other spots you mention -- sounds like fun and exotic items abound!